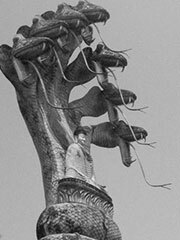 In Hinduism and Buddhism, Mucalinda is a naga, a snake-man, who protected the Buddha from the elements before his enlightenment. It is said that four weeks after Gautam Buddha began meditating under the Bodhi tree, the heavens darkened for seven days, and a prodigious rain descended. However, the mighty king of serpents, Mucalinda, came from beneath the earth and protected with his hood the one who is the source of all protection. When the great storm had cleared, the serpent king assumed his human form, bowed before the Buddha, and returned in joy to his palace.